The "Possible Causes" is the list of all the items, components or circuits that should be inspect, test, repair or replace to fix the OBDII code. AutoCodes.com goal it to help you find the best possible solution to your OBDII code problem. - Why is the Engine Light ON? 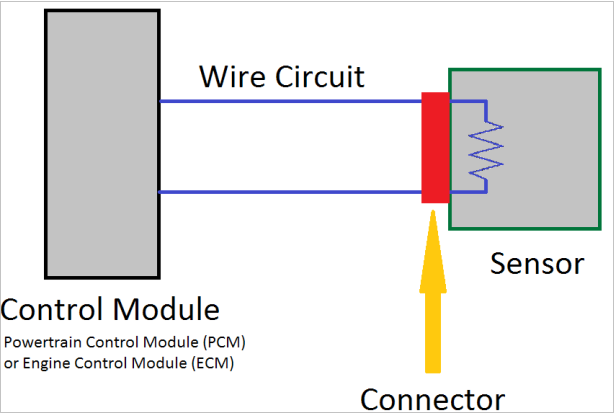 It means that the wire(s) connected from and to the component (sensor, solenoids, actuator, etc.) is either open (cut, broken, disconnected) or shorted (touching other wires, components, body). "Open" and "short" are common electrical terms. An open is a break in a wire or at a connection. A short is an accidental connection of a wire to ground or to another wire. In simple electronics, this usually means something won't work at all. With complex electronics (such as ECMs or PCMs) this can sometimes mean something works, but not the way it's supposed to. It means that the component (sensor, solenoids, actuator, etc.) connector is not fully connected or is disconnected. Before replacing any components, try fully disconnecting the connector, reconnect and test the system or component again. When "engine mechanical problem" is listed as possible causes of the OBDII code, it means that the problem is not caused by an electronic component, but rather by a mechanical component such as pistons, valves, mechanical pump, etc. "Engine Lean" or "Lean Mixture" means there is an excess of air during the engine combustion. The ideal Air/Fuel (A/F) ratio is 14.7:1, which means 14.7 parts of air to one part of fuel. Intake gaskets, faulty Mass Air Flow (MAF) and faulty A/F Sensors, are common problems when the engine is running too lean. "Engine Rich" or "Rich Mixture" means there is an excess of fuel during the engine combustion. The ideal Air/Fuel (A/F) ratio is 14.7:1, which means 14.7 parts of air to one part of fuel. Leaking fuel injectors, bad spark plugs, faulty Mass Air Flow (MAF) and faulty A/F Sensors, are common problems when the engine is running too rich. ** If you have a comment about an specific code, please post the comment on the code page.